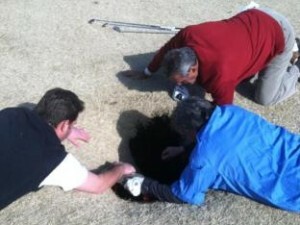 A golfer had a surprise last week when a sinkhole opened beneath his feet. While playing a round with friends at Annbriar Golf Course in Waterloo, Illinois, golfer Mark Mihal disappeared. He had fallen into a bell shaped muddy cavity about 5.4 meters (18 feet) deep. Trapped inside, his friends immediately called the clubhouse to request a ladder and a rope. With a dislocated shoulder and a ladder that wasn’t quite long enough to reach the bottom, Mark was unable to get out on his own. Hoping to get him out as fast as possible, one of his buddies climbed into the hole, made a sling for his arm before putting fastening a rope around him so they could haul him to the level of the ladder. After only a short 20 minutes underground, Mark had been rescued from the hole and transferred to an ambulance. In a bizarre turn of events a hole in one turns into one in a hole.